The strategic importance and project budget for your web efforts will largely determine the size and skill depth of your web site development team. Even for a smaller project, however, you’ll need to cover the core team disciplines. In most small to medium projects one person may handle multiple tasks or someone with specialized expertise (graphic design, for instance) is hired for specific assignments. Many managers who are assigned the responsibility of creating a web site don’t have the luxury of picking specialist team members. Inventory the skills and aptitudes in the team you assemble, and consider careful outsourcing to supply any expertise your team lacks. The project sponsor or stakeholder is the person or group responsible for initiating the web site project. In most instances the sponsor is the client or customer for the web site development work, but in smaller in-house department projects the sponsoring manager and the web project manager may be the same person. The sponsor provides the overall strategic vision and purpose for the site development project, approves the contract or work plan, is responsible for the budget and project schedule, and provides the resources to support the work of the site development team. The sponsor is the client the team works to please, but sponsors have critical work to perform as part of the overall site development team. Sponsors act as a liaison to the rest of the sponsoring organization, provide critical domain expertise, coordinate with the larger goals of the sponsoring organization, and deliver site content and domain expertise to the project. As such, it is critical that sponsors and other stakeholders understand their responsibilities to the web team: late delivery of web site content is the most common cause of blown schedules in web development projects. Sponsors also are typically responsible for third-party or external content contracts, other media licensing negotiations, and coordination with other marketing, information technology, and communications efforts at the sponsoring organization or company. The web project manager coordinates and communicates the day-to-day tactical implementation of the web site project, acting within the constraints of the project charters and goals, project budget, development schedule, and quality objectives laid out in the planning stages. The project manager is the team member ultimately responsible for keeping the overall team activities focused on the site strategic objectives and agreed deliverables, and he or she continually monitors the scope of the project activities to ensure that the team stays “on time and on budget.” The project manager acts as the primary contact between the web team and the sponsor and manages the overall communication among creative, technical, and production elements of the web site team. In larger web projects the project manager is not normally part of the hands-on production team, but in smaller in-house projects the sponsor, design lead, or technical lead may also act as the project manager for the site team. Project managers create and maintain the project planning and strategy documents, budget spreadsheets, project schedules and Gantt charts, meeting notes, billing records, and other project documentation that details the team’s activities (fig. 1.1). Figure 1.1 — Gantt charts are commonly used to keep track of project phases and team responsibilities. The usability lead’s role is to shape the overall user experience. The usability lead works closely with the information architect—in fact, the same individual often fills both information architect and usability roles. As the primary user advocate on the development team, the usability lead has responsibility for user testing, user research and persona development, and universal usability standards for the site project. In the initial stages of design, the usability lead is responsible for running interviews, field studies, and usability tests and for producing personas and scenarios to inform project requirements. Once designs are conceptualized in the form of diagrams, wireframes, and prototypes, the usability lead tests the designs with users and gathers feedback for the site designers and developers. In the final stages of a project, the usability lead evaluates the effectiveness of designs through additional field studies and user testing and ensures that universal usability goals are met. 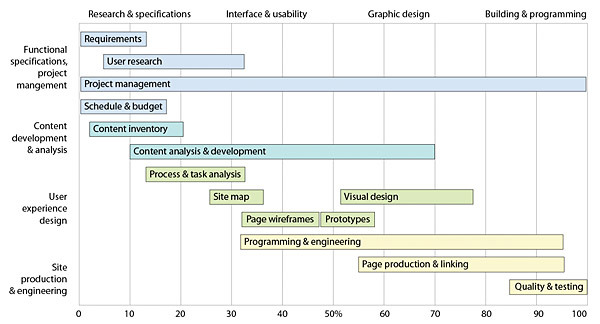 The usability lead is also responsible for evaluating the success of the project (Does the site accomplish the goals? Are users successful and satisfied with the design?) and for measuring project outcomes (Are more users visiting the site? Is the site producing more revenue?). The site information architect organizes and categorizes web site structure and content. 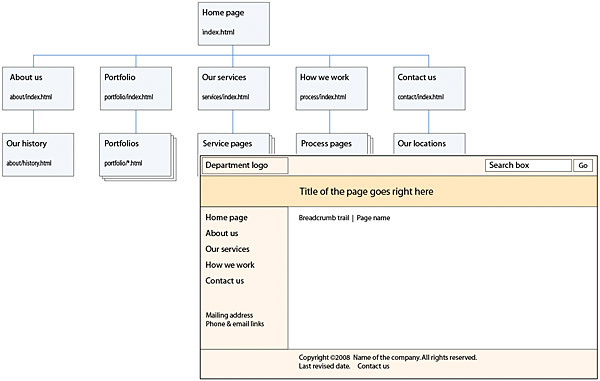 The information architect is most active early in the design and planning phases of the project, developing content categorization schemes, consistent site terminology, content structure across the site, and site architecture diagrams that explain the overall site planning to both the sponsor and the web team members. Information architects also work closely with the site designers to craft page “wireframes,” the diagrammatic page grids that show how various areas of the page will be used to support site identity, navigation, and page content. Page wireframes form the crucial link between the overall site architecture and what the user sees on each page of the web site, determining how easily a user can find the site’s content and features and shaping the user’s overall experience. Information architects often have a background in library science, using controlled vocabularies, carefully designed content and navigation nomenclature, and search techniques to help users find relevant content. The primary deliverables from the information architect are usually charts and diagrams: site architecture overviews, page wireframes, and user interaction explanations. These visual representations of the site planning process are crucial to communicating site structure and user experience to both sponsors and other web team members, particularly the back-end technical developers who support the interactive elements of the site. 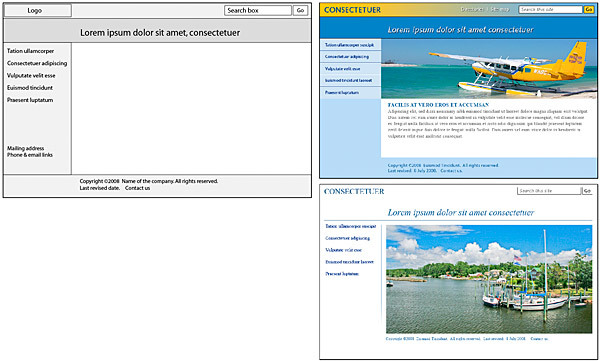 Wireframes in particular are used by the usability lead to test design concepts with users (fig. 1.2). Figure 1.2 — Web site designs are necessarily abstract. Planning diagrams such as wireframes are a crucial means to convey ideas about the site structure. The art director’s primary responsibility is the overall look and feel for the web site, establishing the site typography, visual interface design, color palette standards, page layout details, and the particulars of how the graphics, photography, illustration, and audiovisual media elements of the site come together to form an integrated whole. As the web has matured over the past decade, many graphic design professionals have become specialists in designing for interactive media for computer screens and are well versed in user interface design, web navigation, and site architecture. In smaller projects an experienced web art director often assumes the information architecture and usability roles in addition to directing the visual design of a site. In the site development and planning stages the art director creates or supervises the creation of increasingly complex design sketches to illustrate the evolving design proposals to the project sponsor and web team. 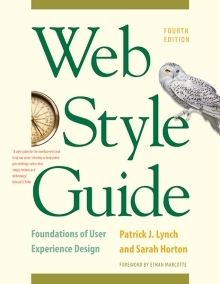 As designs are approved the art director supervises the conversion of these design sketches into the detailed specifications of graphics and typography that the page engineers will need to create html (HyperText Markup Language) page templates (fig. 1.3). In larger organizations the art director is usually the person responsible for assuring that the new web design work is consistent with any established corporate identity and user interface standards. Figure 1.3 — Wireframes inevitably look boxy, but the final visual designs don't need to be. The web technology lead must have a broad grasp of web publishing environments, development languages and web development frameworks, web database options, and network technology. The technology lead acts as the bridge, translator, and plain-English communicator between the technologists and the creative and project management elements of the team. As part of the site planning process the technology lead creates the general blueprints for the collection of technologies that will support the chosen web site technology framework, including content management, rss (Really Simple Syndication) or other xml (Extensible Markup Language) content formats, database integration and support, custom web programming, and integration with other applications or databases that supply content or interactive features to the web site. The technology lead provides the primary data-processing architecture for the project, determining the technical specifications for the overall web development framework, assessing the developing strategy and goals, and matching those needs to appropriate technology solutions. In larger projects the web technology lead typically manages teams of programmers, network or server engineers, database administrators, software quality assurance testers, and other information technology professionals that support the production and design teams. Early in the design stage the site production lead is responsible for converting initial web site page mockups, designs, and wireframes into html pages. Once the site has been planned and the design and information architecture plans have been completed, the site production lead manages the work of building the site’s pages, either directly in “plain” html or within a web content management system (cms) or using web site production software such as Adobe Dreamweaver. In coordination with the site technical team, the site production lead is typically responsible for creating the master page templates in xhtml (Extensible HyperText Markup Language) and Cascading Style Sheets (css), validating page code, and assembling the work of the information architects and site graphic designers into finished page templates ready to be filled with content. If a cms is used to deliver the finished content, the html/css page templates must be converted into the required format. In larger projects the site production lead usually manages a staff of web designers who fill pages with content, integrating finished text, graphics, and audiovisual elements on each page and linking pages to the larger web site and (usually) to other web pages on the Internet. In many web teams the site production lead also manages the work of site editors and copywriters. The site editor has overall responsibility for the written content and editorial quality of the finished site. He or she creates the editorial tone for the web site, determines style guidelines, and works with clients and content domain experts to collect, organize, and deliver finished text to the production team. In smaller teams the editor creates site copy, interviews domain experts to create content, and may be responsible for creating news and feature material for the site. Experienced editors also play an increasingly important role in the technical and production aspects of site content, ensuring that written content from the sponsoring organization is provided on time, in the specified editorial and technical markup format, and with sufficient quality to meet site goals. This technical aspect of content formatting is particularly important in sites where the content is ultimately delivered through a cms, in xml, or from dynamic links to a content database. Because most search engine optimization (seo) efforts are based on careful, consistent use of keyword language and heading markup, the web editor is also the team member most likely to lead the day-to-day efforts to make the site as search-friendly as possible. Keeping the site optimized for both local search engine visibility (using your own local search tools within your site) and keeping public sites maximally visible to general Internet search engines like Google and Yahoo! are crucial strategic components of making the new content accessible and findable for your audience. Unlike the other site development roles described above, the site editor’s role is a long-term job, bridging the transition from a site development project into an ongoing web publication process that maintains the web site after launch and keeps the content fresh and relevant to your audience. If the project manager is the focal point of the early stages of creating your site, then the site editor should gradually assume the leadership role in the stages just before, during, and after the site launch. This transition of responsibilities ensures that the site won’t become an orphan after the project team leaves the launch party and moves on to new assignments.